A QR plate mounted on a lamp post. 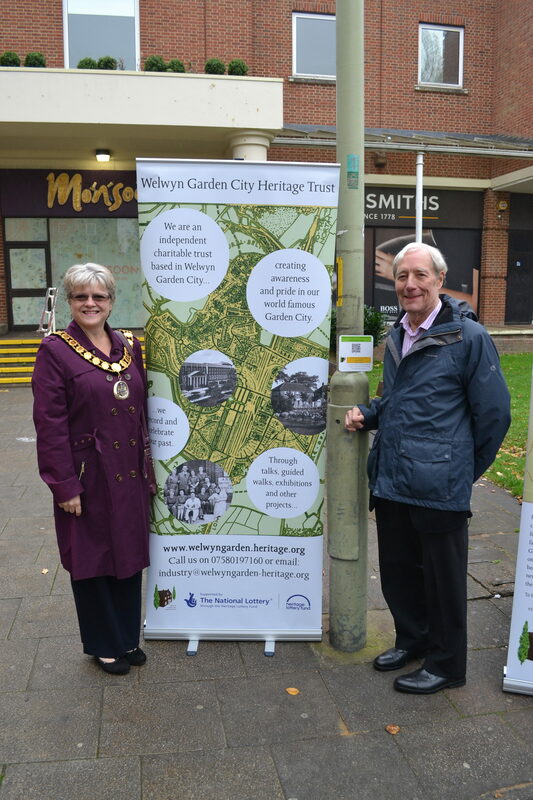 On the 23rd October, 2017, the Welwyn Garden City Heritage Trust launched a new way of presenting the history of the town using digital technology. The system, developed by the Heritage Trust uses well tried existing technology in a completely new way. Users with smart phones will now have access to the Trust’s Town Centre Trail simply by clicking on to specially designed signs mounted on lamp posts. The system has been designed to work with both I-Phone and Android mobiles and with WiFi enabled tablets. The system uses any one of a number of freely downloadable packages that will read the code on each sign and immediately link the phone to the Trust’s website. As each sign has a unique code in the form of a Quick Response Sign/Flash Code the user will be connected directly to information about the history of their location. 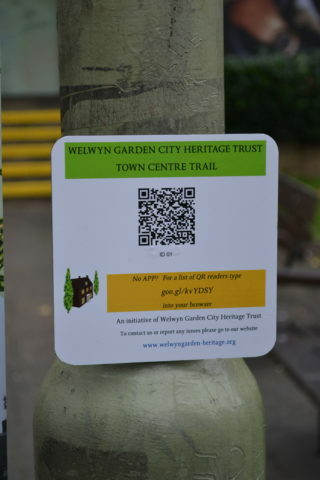 Research by the Trust has shown that the system is not in use anywhere else in the UK and so gives Welwyn Garden City a ‘Digital First’. The trail starts outside the Howard Centre and each location not only gives historical details but provides a map showing how to get to the next location in the sequence. The system will be extended to other parts of the town as soon as possible. This page was added on 23/10/2017. Where Do You Think You Live?